“If you’re not at the table, you’re on the menu.” –Ethan Winter, New York Senior Program Manager for the Land Trust Alliance. 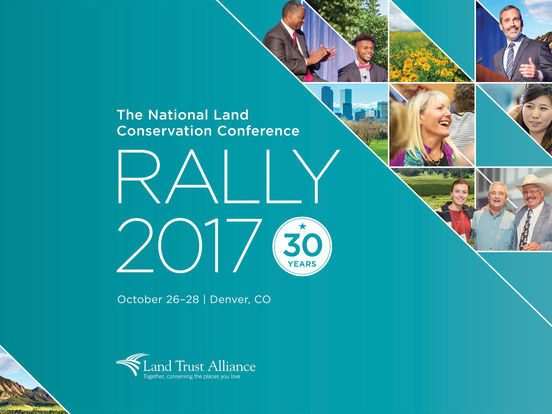 Over the last weekend of October, I attended the annual Land Trust Alliance Rally in Denver. Besides soaking in the dry air I grew up in, I spent a whirlwind of a weekend, attending seminars, talking with practitioners and accumulating innovative ideas for land conservation. This conference brings together members from the land trust community, conservation scientists, ranchers, geospatial analysts, government agency personnel – the list goes on. It was obvious that private land conservation is an evolving field, with innovative practices happening across the country. I attended a seminar titled “How and Why to Partner with American Tribes.” In this seminar representatives from the Trust for Public Land and several private foundations spoke about the success of the Kashia Coastal Reserve in the coast of Sonoma County. TPL saw the opportunity in this reserve to achieve multiple goals. This 700-acre parcel land was essential for connecting protected lands and adding a link to the California Coastal Trail. TPL also saw this as a chance to return ancestral grounds to the Kashia Band of Pomo Indians. TPL was able to build trust within the tribe. After purchasing the easement, TPL handed over the management of the land to the Kashia. These are the projects I want to focus on in my career. It was refreshing to talk about best practices in real, concrete situations. I left with a renewed sense of motivation to gather as many skills and knowledge as I can to eventually return to this conference as someone working in the field. 1. Look for partnerships where you might not expect them (i.e. tribes, schools, social justice, art foundations). 2. Projects that align with multiple visions are more likely to receive funding. 3. Private land conservation is advancing in ways we have not seen before, yet organizations are understaffed and lack funding. Entering this field will require rapid self-learning along the way. 4. Appraisal of projects is the most important step. Don’t be afraid to cancel land deals. Easements must remain voluntary and incentive-based. 5. Invest in building relationships. This entry was posted in News, People and tagged Ben Williamson. Bookmark the permalink.